Sofia the First: Once Upon a Princess on DVD Only $9.96 (Reg. $19.99)! You are here: Home / Great Deals / Amazon Deals / Sofia the First: Once Upon a Princess on DVD Only $9.96 (Reg. $19.99)! Does your daughter like Sofia the First? 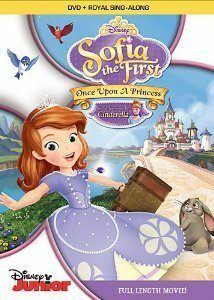 Check out this movie deal I just found – right now, you can get Sofia the First: Once Upon a Princess on DVD for just $9.96, down from $19.99! And, shipping is FREE with Amazon Prime or Super Saver Shipping! I need to get this one for my daughter! She’s a HUGE Sofia fan! Set in the storybook world of Enchancia, the movie introduces Sofia, an average girl whose life suddenly transforms when her mother marries the king and she becomes a princess, Sofia the First. Sofia must learn to navigate the extraordinary life of royalty while holding onto her own hopes and dreams. Her journey to be the best she can be also paves the way for those around her to realize how special they each are. Cinderella makes an appearance in the movie to offer Sofia some words of wisdom, princess to princess. Sofia’s royal adventure begins as she prepares to move into the castle with her mom, starting a new family with her step-father, King Roland II, and step-siblings, Amber and James. Helping Sofia in her journey are the three headmistresses of Royal Prep Academy – Fauna, Flora, and Merryweather (the beloved fairies seen in Disney’s classic Sleeping Beauty), and royal steward, Baileywick, as well as a group of cute woodland creatures led by a wise-talking rabbit, Clover. Sofia soon discovers that looking like a princess isn’t all that difficult, but displaying honesty, loyalty, courage, independence, compassion, and grace is what makes one truly royal.